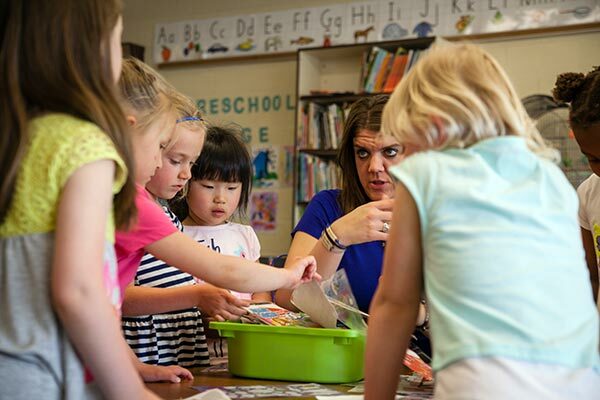 What do preschoolers learn at Living Stones Academy? Well, more than you might think. Preschoolers at LSA learn how they fit into God’s big world. They learn how this place called “school” works. And they learn important academic and social-emotional skills they’ll use for the rest of their lives. Preschool shouldn’t be boring. Preschoolers learn important concepts through play-based exploration, activity centers, Bible stories, and recess. Children also learn through music. Music Together is our formal music program, and music is used daily in the classroom. Preschoolers love exploring God’s world with field trips to an apple orchard, a pumpkin patch, museums, zoos, and Camp Roger. Preschoolers are important. At LSA, preschool is an integral part of our learning community and so we incorporate our youngest learners into the life of our school. Preschoolers participate school-wide activities like weekly worship, Grandfriends’ Day, and MLK Day Celebration. They love classroom activities with their 2nd and 3rd grade buddies, and learning about books in the school library. Preschoolers are such a valued part of the entire LSA community.